Developers of renewable energy projects often find it difficult to raise funding for their projects as these projects are generally capital-intensive and require large capital investments. On the other side, institutional investors in renewable energy projects often face considerable risk of having to invest in one to few mega projects due to liquidity limits with their investment funds as the length of the development timeline of these projects can be long. In addition, most of the individual investors are not able to participate in these projects directly as more often than not they have a minimal contribution requirement, sometimes as high as $100,000. 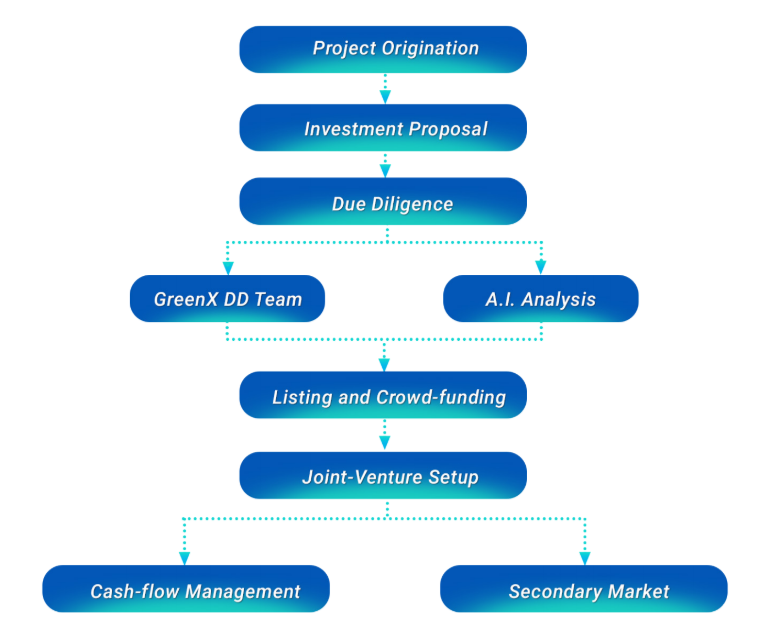 Listing on the GreenX Capital Market is subject to an independent due diligence process along with an AI-based comparative risk analysis. Furthermore, GreenX amis to bridge the gap between its crypto platform and the real world by setting up GreenX subsidiaries registered in the respective project countries along with shared cash accounts with the developer, through which all investments and their returns are channelled. On the other hand, GreenX Global Exchange enables the investors to purchase equities of investment-ready, developed projects immediately where they do not wish to wait during the developing period of the projects. The blockchain infrastructure allows green energy developers to tokenize their projects and attract investments from the crowd. Each investment proposal represents a tokenization event of a green energy project. The project equity is, in fact, a smart contract receipt, backed by real assets – which is the green energy equipment and infrastructure that the developer builds. The project can be funded by pooling small investment amounts from investors globally. Without cryptocurrency, this practice is near impossible to implement with fiat money due to legislation hurdles. The smart contract mechanism helps GreenX build a global, decentralized funding model that is not possible with fiat. The smart contract assures investor that there is no “smoking mirrors” or “back-room dealings” with the projects. All terms and conditions are laid out in codes and can be inspected quickly and easily. Lastly, the usage of blockchain technology protects the investors’ privacy while keeping necessary elements of the funding process visible. GreenX divides data into on-chain and off-chain. Most sensitive information such as KYC/AML clearances is encrypted and saved off-chain. On the other hand, public terms of investments are stored on-chain to showcase the project’s data integrity. Despite having significant potentials, the green energy market currently faces multiple problems. Institutional investors, individual investors, and green energy developers all faces different challenges when participate in this market. Green Energy Developers: the developers join the GreenX network to raise funds for their projects. 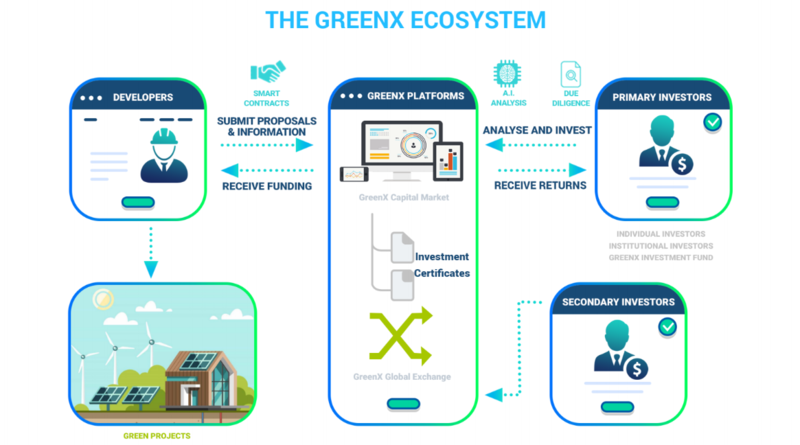 The ecosystem appeals to them because raising funds on GreenX exchanges have superior advantages compared to traditional fundraising, including assess to global capital pools, streamlined investment procedures, and low costs and commissions. GreenX Syndicate Network: GreenX’s syndicate networks comprise of accredited investors and institutional investors with close relationships to GreenX. The GreenX platform allows its syndicates to diversify their investments, thus reducing risks. For example, instead of investing $10,000,000 in one solar project with the traditional model, an investment fund can use GreenX to invest portions of the same $1,000,000 in 10 different projects, reducing the exposure for its portfolio. Project Inception & Development.GreenX roadmap and infrastructure blueprint created and tested. Proof of conceptPrivate capital raised. Develop relationship with corporate partners.Start MVP development for the GreenX Capital Market platform and the GreenX Global Exchange platform. Token Sale Campaign. Public Pre-sale commends on May 15th, 2018.Tokens are listed on public exchanges within 2 weeks after ICO finishes.Create GreenX Artificial Intelligence. Alpha release of the GreenX Capital Market platform.First projects listed and funded.Alpha release of the GreenX A.I. Investment Analysis system. Expand corporate relationships.Establish GreenX Energy Alliance.Alpha release of the GreenX Global exchange platform.Start development of the GreenX Visual Smart-contract Scripter. Continue to add companies into the GreenX Energy Alliance.GreenX Global Exchange becomes fully functional.Start development of the GreenX Mezzanine Blockchain Interface. Establish the GreenX Green Energy Investment Fund.Alpha release of the GreenX Visual Smart-contract Scripter.Alpha release of the Greenx Blockchain interface.Begins research on native token development and side-chain efficiency development.